AirAsia X has joined sister low-cost group AirAsia in slowing its expansion in the Malaysian market by selling aircraft, deferring deliveries and wet-leasing excess capacity. The two Malaysian subsidiaries of the AirAsia/AirAsia X groups combined now only plan to add one aircraft, an A320, in 2015. The adjustments should help drive improvements in yields and profitability. AirAsia X incurred a loss for the fourth consecutive quarter in the 3Q2014 while AirAsia saw its profits slip again - although remaining among the most profitable in the region. AirAsia and AirAsia X are wisely not holding out for a restructuring at rival Malaysia Airlines (MAS), which at least for the time being is not pursuing any significant reductions to capacity. AirAsia X, which recorded 42% ASK growth in the first three quarters of 2014, will now only increase ASKs in the Malaysian market by 5% in 2015. Short-haul LCC Malaysia AirAsia (MAA) on 19-Nov-2014 reported a 14% drop in operating profit for 3Q2014 to MYR227 million (USD71 million). Net profit was down 85% to MYR4 million (USD1.3 million) but pre-tax net profit was up 5% to MYR26 million (USD8 million). Revenues were up only 3% to MYR1.317 billion (USD413 million). AirAsia started pursuing in early 2014 a conservative – and rational – approach to short-haul capacity in the Malaysian market. Seat capacity in 3Q2014 was flat compared to 3Q2013 levels while ASKs were up only 1%. Yields (RASK) were up 2% for the second consecutive quarter, an encouraging sign that capacity constraints are bearing some fruit. But yields and average fares are still below historic levels and competition remains intense. AirAsia X meanwhile reported on 19-Nov-2014 a net loss for 3Q2014 of MYR211 million (USD66 million) and an operating loss of MYR140 million (USD44 million). AirAsia X has been highly unprofitable this year, racking up net losses of MYR351 million (USD108 million) and operating losses of MYR308 million (USD95 million) through the first nine months of 2014 on a revenue base of only MYR2.12 billion (USD654 million). In comparison AirAsia X generated MYR71 million (USD23 million) in operating profits and MYR44 million (USD14 million) in net profits in 9M2013, including an operating profit of MYR25million (USD8 million) and net profit of MYR26 million (USD8 million) in 3Q2013. AirAsia X’s operating margin of -15% for the nine months period, including -20% for 3Q2014, is an obvious cause for concern. AirAsia X’s stock price has dropped by more than 40% over the last year. AirAsia X has responded by suspending the expansion of its Malaysian operation and cutting capacity to Australia, where market conditions have particularly been challenging, aggravated by a sharp fall in the AUD. In reporting 3Q2014 earnings, AirAsia X announced it was selling two of the eight A330-300s it had committed to adding in 2015. The original 2015 fleet plan had both these aircraft allocated to the Malaysian market. AirAsia X also stated it was deferring four of the eight A330-300 deliveries that were initially slated for 2016 and three of the eight deliveries that were slated for 2017. Two of these aircraft have been deferred until 2018 while the other five have been converted to A330-900neo orders, raising the group’s commitment in the new type to 55 aircraft. AirAsia X expects to begin taking the A330-900neo in late 2018 and take all 55 by the end of 2026. The six A330-300s the long-haul low-cost group is still taking in 2015 will be used to grow the new affiliates in Indonesia and Thailand. Indonesia AirAsia X (IAAX) and Thai AirAsia X (TAAX) will each end 2014 with two A330-300s while the original Malaysian operation will end the year with a fleet of 19 A330-300s. The revised fleet plan envisions the Malaysian subsidiary ending 2015 with the same 19 A330-300 while the IAAX fleet grows by one aircraft for a fleet of three A330-300s and the TAAX fleet grows by three aircraft for a fleet of five A330-300s. AirAsia X also expects IAAX and TAAX to account for a majority and potentially all of the deliveries in 2016 and 2017. The group sees bigger opportunities in Indonesia and Thailand as medium/long-haul routes in these markets are not yet penetrated by LCCs. As is the case with the sale of the 2015 delivery slots, the deferrals for 2016 and 2017 will impact the rate of growth in Malaysia as they are not intended to impact the new affiliates. The Malaysian fleet also currently includes two A340-300s and one A330-200. But these aircraft have been wet-leased out in recent years and are due to be returned by early 2015. As part of its effort to decelerate growth in the Malaysian market, AirAsia X has decided to continue its wet-lease business after its A340-300s and A330-200 exit the fleet by using A330-300s. AirAsia X has forged several wet-lease contracts covering A330-300s in 2Q2015 and 3Q2015. A total of 24 aircraft months have been committed to, which is the equivalent of two aircraft for the full year or in this case four aircraft over a half year. Wet-leasing was never viewed by AirAsia X as a core activity and it was initially pursued purely as a way to keep unwanted aircraft flying until their leases expired. AirAsia X discovered A340s, which were used to serve London and Paris until Europe services were axed in 2012, and smaller A330s (A330-200s) could not be profitable in that long haul scheduled operation, dogged then by very high fuel prices. AirAsia X still does not view wet leasing as a core function and does not expect to be in the wet lease business permanently. But regularly wet leasing out aircraft would be logical during off-peak periods given the seasonal fluctuations AirAsia X has noticed in several of its key markets. The low season for AirAsia X – the second and third quarters – coincides with the period of high demand for seasonal wet leases in other markets such as Europe, Latin America and North Africa. The 2015 schedule for Umrah religious pilgrimage flights to Saudi Arabia are also in the second and third quarters. AirAsia X stated that all its wet lease contracts provide revenue guarantees that generate net margins of 10%. This is a margin that AirAsia X would struggle to achieve during off peak periods even factoring in an improvement to the current market conditions. AirAsia X executives pointed out during the carrier's 3Q2014 earnings briefing that the full A330-300 fleet will be in scheduled services in 1Q2015 and 4Q2015. The idea is to only pursue wet leasing in the second and third quarters, when AirAsia X is unable to fill all its flights at a reasonable yield. AirAsia X has recorded year over year yield declines for five consecutive quarters (as measured by RASK), including an 8% drop in 3Q2014. Yields have particularly been weak on its Australian routes as overcapacity in the Malaysia-Australia and broader Southeast Asia-Australia market has led to aggressive pricing. AirAsia X plans to cut ASKs to Australia by 15% to 20% in 2015 with nearly all the reductions only taking place during the second and third quarters when demand is relatively weak. For example Kuala Lumpur-Sydney will be cut from two to one daily flight for most of 2Q2015 and 3Q2015. AirAsia X is also expected to cut a smaller number of frequencies to its other four Australian destinations. The carrier is confident the reductions will better align capacity with demand, enabling higher yields and hence an improved financial performance. AirAsia X incurred losses of MY279 million (USD86 million) on Australia routes in the first nine months of 2014, including MYR121 million (USD38 million) in 3Q2014. The EBITDAR margin on Australia routes was -15% in 3Q2014, representing a slight improvement compared to 2Q2014 - but still unsustainable. The EBITDAR margins on North Asia routes and what AirAsia X classifies as other routes (includes Saudi Arabia, Sri Lanka and Nepal) have remained positive. Chinese destinations will also see some small frequency reductions during parts of 2Q2015 and 3Q2015. But total ASKs to China will not be reduced in 2015 compared to 2014 as Chongqing is being launched in early 2015. North Asia overall capacity will increase in 2015, mainly driven by the full year effect of flights that were added during 2014. Overall AirAsia X ASKs are projected to increase 5% in 2015 compared to 2014 levels, with increases to North Asia and other markets offsetting the decrease to Australia. As CAPA previously outlined, AirAsia X pursued aggressive but strategically important expansion in 2H2013 including doubling capacity to Australia. MAS meanwhile increased total ASKs by 19% in 2013 and expanded in the Australia market by over 20% in late 2013 and early 2014. Melbourne and Sydney both saw the introduction of a third daily flight from MAS and a second daily flight from AirAsia X.
AirAsia X currently operates 54 weekly flights to Australia including 14 to Melbourne, Perth and Sydney, seven to the Gold Coast and five to Adelaide. Adelaide will be served with seven weekly flights in Dec-2014, according to OAG data. 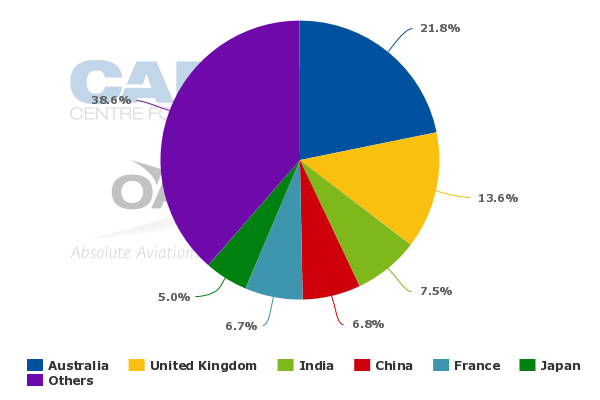 Australia currently accounts for about 42% of AirAsia X's ASKs and 35% of its seats, according to CAPA and OAG data. MAS currently operates 70 weekly flights including 21 to Sydney and Melbourne, 10 to Perth, seven to Adelaide and Brisbane and four to Darwin. Perth will be served with 12 weekly frequencies in Dec-2014, according to OAG data. 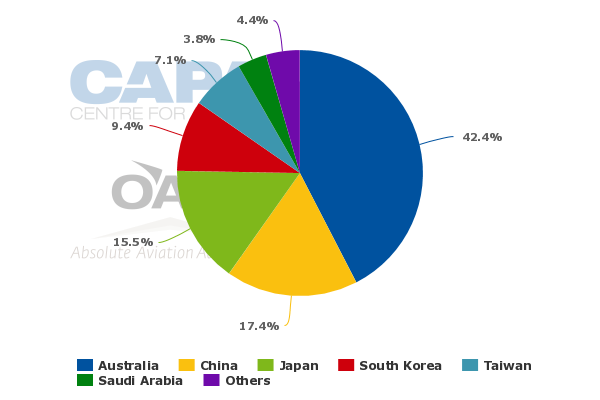 Australia currently accounts for about 12% of international seats at MAS and 22% of international ASKs, according to CAPA and OAG data. While MAS operates more flights, MAS and AirAsia X have approximately the same number of total seats in the Malaysia-Australia market as AirAsia X configures its A330s with more seats. Both carriers operate A330-300s on all Australian flights except the MAS service to Darwin, which uses 737-800s. AirAsia X and MAS have so far maintained capacity levels to Australia with the exception of some seasonal ad hoc reductions by both carriers (typically a couple of weekly frequencies for relatively short periods). AirAsia X is now taking the lead in reducing capacity to Australia on a more regular basis. AirAsia X is hoping MAS follows but the MAS management team at least for now has no intention of making similar adjustments. AirAsia Group CEO Tony Fernandes stated during the 19-Nov-2014 AirAsia X earnings briefing that the new business plan for AirAsia X does not assume any changes at MAS. Mr Fernandes, who does not normally participate in the AirAsia X calls, sees potential changes at MAS simply as a “bonus”. AirAsia X cited aggressive pricing from MAS for driving down yields, including in the Australia market. AirAsia/AirAsia X executives also believe both companies have been impacted by MH370 and MH17 with fare compression following both incidents. But MAS executives argue that AirAsia has been more aggressive with fares, including in the Australia market. The reality is the current situation was inevitable – regardless of MH370 and MH17 – as both MAS and AirAsia X expanded too fast in 2013. The Malaysian market became intensely competitive due to rapid expansion by all players – AirAsia/AirAsia X, MAS and start-up Malindo Air. Yields were already declining sharply prior to MH370 and MH17, which exacerbated the situation, but is not the cause of the predicament that AirAsia X (and MAS) is now confronted with. The finger pointing is all rather silly. Of much more relevance are the initiatives AirAsia X is now pursuing to improve its own situation. While the Malaysian industry waits for MAS to start restructuring, publicly listed AirAsia X deserves credit for making its own adjustments. Mr Fernandes sees the challenges that AirAsia X has faced in 2014 as extraordinary and is confident the long-haul LCC is now well positioned for the long-term. ASKs are projected to be up only 8% in 4Q2014, which along with improvement in market conditions and cost reduction initiatives should lead to a significantly improved financial performance in the final quarter of 2014. AirAsia X executives said during the 3Q2014 results briefing that the carrier is expecting a double digit improvement in yield (RASK) for 4Q2014. While RASK was down 8% in 3Q2014 AirAsia X executives said there was an improvement in Sep-2014 and again in Oct-2014. AirAsia X is also confident of several improvements in its cost structure for 2015. Fuel costs will come down as the group has only hedged 12% of its fuel requirement for 2015, enabling the group to benefit from the recent substantial drop in fuel prices. In addition AirAsia X has been working on pursuing more cost synergies with sister group AirAsia. Tony Fernandes is leading this initiative and been taking a more active role at AirAsia X. For example AirAsia and AirAsia X are consolidating ground handling and ramp functions which are expected to result in higher productivity and job cuts. Mr Fernandes told analysts during the AirAsia X 3Q2014 earnings call that there is no consideration of AirAsia potentially taking over AirAsia X and instead the focus is on pursuing joint opportunities for cost reductions (the two groups are separately listed). He said AirAsia X is also working with leasing companies to drive down its leasing costs. Meanwhile short-haul LCC Malaysia AirAsia (MAA) also plans to maintain a disciplined capacity approach in 2015. MAA has been impacted this year by challenging market conditions and excess aircraft. As CAPA outlined in Aug-2014, MAA’s has had several more A320s in its fleet than its schedule required due to delays in selling aircraft. As a result MAA had to ground several A320s in mid-2014 and reduce utilisation levels. MAA ended 3Q2014 with 81 A320s, up 23% from 66 at the end of 3Q2013 despite flat capacity. This includes aircraft that were idle. MAA expects to start improving utilisation rates as its fleet will shrink slightly in 4Q2014. The AirAsia Group is no longer committed to any A320 deliveries in 4Q2014 and expects to finally complete the sale of three aircraft, which will be partially offset by the return of one aircraft that had been leased out. The net reduction of two aircraft should enable MAA to reactivate idle A320s and bring utilisation rates closer to normal levels. MAA is also now slated to add only one A320 in 2015 as AirAsia Group has again reduced its 2015 commitments. In discussing 3Q2014 earnings with analysts, AirAsia said it now plans to take only five A320s in 2015, with four earmarked for Thai AirAsia (TAA) and one for MAA. CAPA analysed TAA 3Q2014 earnings in a separate report that was published on 16-Nov-2014. AirAsia had previously stated it was suspending fleet expansion in Indonesia and the Philippines through at least 2015. But the revised fleet plan for 2015 indicates a decision to also not pursue any expansion of the fleet in 2015 in India and to potentially delay launching its planned new affiliate in Japan until 2016. In its previous version of its 2015 fleet plan, which was released in Aug-2014 as 2Q2014 earnings were reported, the AirAsia Group had earmarked three additional A320s for India and an additional three A320s for Japan. Five A320 deliveries overall for the group marks a huge slowdown as AirAsia originally was committed to taking 29 A320s in 2015. In Feb-2014 the group initially announced 12 deferrals, which reduced its commitment to 17 aircraft. In Aug-2014 it announced another four A320 deferrals, reducing its commitment to 13 aircraft. The group has now brought this figure down by another eight aircraft to only five aircraft by pursuing four more deferrals and selling four delivery slots. AirAsia Group also earlier announced a reduction in commitments for 2015, 2016 and 2017 through deferrals – a move now followed by AirAsia X with its sale or deferrals for 2015, 2016 and 2017. The adjustments at AirAsia and AirAsia X are sensible. But AirAsia now risks losing market share to Lion Group, which has not yet deferred any of its orders. Lion still expects to take about 60 aircraft in 2015. All of these aircraft are expected to end up with Lion Group carriers in Southeast Asia as Lion Group leasing subsidiary Transportation Partners recently stated that it is not intending to lease out any aircraft in 2015 to airlines outside the Group. MAS is not about to expand and, in commercial terms, it is unlikely the carrier will try to grab any Australia traffic rights that could become available from AirAsia X reductions. But MAS cuts are also not expected at least for the time being. The current MAS executive team has decided to maintain capacity as it believes cuts would result in higher losses due to reduced utilisation of aircraft than the losses it is now incurring by keeping its current schedule. Major network or route decisions also cannot be made until a new management team is in place. MAS expects to transition to a new company with a new management team in mid-2015. At that point the restructuring plan outlined by its government shareholder will start to be implemented including job cuts and potential network adjustments. But even then the plan envisions maintaining or even potentially expanding capacity within Asia-Pacific, which is the only region that MAS overlaps with AirAsia and AirAsia X. Long-haul cuts are more likely but this is a sector of the market that AirAsia does not compete in and it is hard is to predict when or even if these cuts will come. The Malaysian market has become extraordinarily challenging and dynamic. AirAsia/AirAsia X have now made adjustments which should help restore rationality and a better supply-demand balance. But how much the market improves will hinge on how its local competitors respond. As this is impossible to predict, Malaysia will again be a fascinating market to watch in 2015.